Travellers to Thailand may come across a special kind of street vendor that doesn't sell any food. Their carts are instead topped with large clear vats containing anonymous liquids of varying transparency. "Energy, male virility, strength;" signs in Thai (and English in touristy areas) boast the many therapeutic benefits gained by drinking a small shot of 'potion'. This potion is known as Yaa Dong and brave tourists who take a seat at one of the cart-side stools will quickly note that the most-certain outcome of drinking several doses is a fiery throat-burn proceeded by drunkenness. Yaa Dong (ยาดอง; "fermented herb in alcohol") is prepared by mixing lao khao (เหล้าขาว; "white liquor"), alcohol most commonly distilled from glutinous rice, with various herbs and allowing the mixture to infuse for 2–4 weeks before use (most street vendors top up the vats daily so the herbal potency is speculative). The resulting concoctions are said to cure many ailments ranging from low energy to trouble in the bedroom. The law is very hazy as to whether Yaa Dong is legal simply because it has mystery additives but usually a blind eye is turned to its public sale. 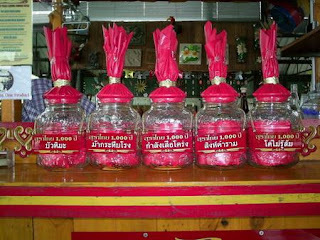 Traditionally it has been a beverage brewed at and distilled and drank at home and it is a popular drink with Thai's, many of whom will have a quick shot glass or two to start or finish the evening. Others will seek it out if suffering from a specific ailment and choose the infusion likely to help. Those looking to sample some of the intoxicating cure-all can by buy a small glass called a 'Thuay Talai' for no more than 10 Baht. Yaa Dong can be sipped or slung back as a shot but is never mixed with anything. The flavour is determined by mix of herbs as well as the time of day as each jar is topped up daily with the base liquor, as it infuses with the herbs and as the level drops the flavour becomes stronger. Case-in-point, booze can be good for you (according to some).